In part 3 of my exploration of variables in QGIS 2.12, I’m going to dig into how variables are scoped in QGIS and what layer level variables are available (you can read parts 1 and 2 for a general introduction to variables). A composer scope, with any variables set for the current composer, plus variables for @layout_pagewidth, @layout_pageheight, @layout_numpages, etc. An atlas scope, if atlas is enabled. This contains variables like @atlas_pagename, @atlas_feature, @atlas_totalfeatures. Any layer level variables you set will be saved inside your current project, i.e. layer variables are per-layer and per-project. 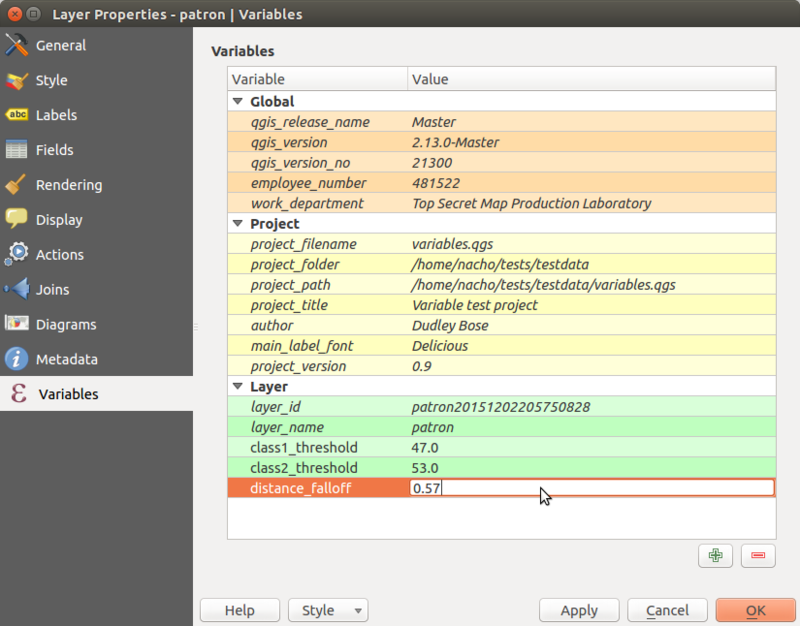 You can also see in the above screenshot that as well as the layer level variables QGIS also lists the existing variables from the Project and Global scopes. This helps show exactly what variables are accessible by the layer and whether they’ve been overridden by any scopes. You can also see that there’s two automatic variables, @layer_id and @layer_name, which contain the unique layer ID and user-set layer name too. *Map for illustrative purposes only… not for cartographic/visual design excellence! If I’d hard-coded the manual class breaks, it would be a pain to keep the labeling and symbology in sync. I’d have to make sure that the breaks are updated everywhere I’ve used them in both the symbology and labeling settings. Aside from being boring, tedious work, this would also prevent immediate before/after comparisons. Using variables instead means that I can update the break value in a single place (the variables panel) and have all my labeling and symbols immediately reflect this change when I hit apply! Another recent use case I had was teaming layer-level variables along with Time Manager. I wanted my points to falloff in both transparency and size with age, and this involved data defined symbol settings scattered all throughout my layer symbology. By storing the decay fall-off rate in a variable, I could again tweak this falloff by changing the value in a single place and immediately see the result. It also helps with readability of the data defined expressions. Instead of trying to decipher a random, hard-coded value, it’s instead immediately obvious that this value relates to a decay fall-off rate. Much nicer! I’m sure there’s going to be hundreds of novel uses of layer-level variables which I never planned for when adding this feature. I’d love to hear about them though – leave a comment if you’d like to share your ideas! This isn’t strictly related to variables, but another new feature which was introduced in QGIS 2.12 was a new “layer_property” expression function. This function allows you to retrieve any one of a bunch of properties relating to a specific map layer, including the layer CRS, metadata, source path, etc. This function can be used anywhere in QGIS. For instance, it allows you to insert dynamic metadata about layers into a print composer layout. In the screenshot below I’ve used expressions like layer_property(‘patron’,’crs’) and layer_property(‘patron’,’source’) to insert the CRS and source path of the “patron” layer into the label. If either the CRS or the file path ever changes, this label will be automatically updated to reflect the new values. So there you go – layer level variables and the layer_property function – here in QGIS 2.12 and making your workflow in QGIS easier. In the final part of this series, we’ll explore the magical @value variable. Trust me, I’ve saved the best for last!